To Cite: Amiri M, Kazerouni F, Namaki S, Darbandi Tamijani H, Rahimipour H, et al. Cytotoxic Effects of the Ethanol Bane Skin Extract in Human Prostate Cancer Pc3 Cells, Int J Cancer Manag. 2016 ; 9(2):e4755. doi: 10.17795/ijcp-4755. Background: It is extensively supposed that vegetarian diet could affect cancer progress and increase the influence of formal chemotherapy. Objectives: The present study was designed to determine the effect of the ethanol Bane skin extract against chemo resistant prostate cancer PC3 cells. Materials and Methods: PC3 and L929 cells were cultivated and then incubated in the ethanol Bane skin extract with various concentrations of 0.78, 1.5, 3.13, 6.25, 12.5 mg/mL in 3 times 24, 48, 72 hours. Cytotoxic effect of the ethanol Bane skin extract on PC3 and L929 cells was examined by MTT assay after 24, 48, and 72 hours. Morphology of PC3 cells was evaluated by Gimsa staining. Results: The ethanol Bane skin extract inhibited proliferation and caused cell death with IC50 values of 2.8 mg/mL on PC3 cells and the IC50 was 6.1 mg/mL on l929 cells. Morphological changes and apoptotic bodies were observed in PC3 cells faced with the ethanol Bane skin extract by staining with Gimsa. Conclusions: The ethanol Bane skin extract could repress the growth of PC3 cell line. This inhibitory effect of the Bane extract depended on the dose and the time on PC3. The result of this study shows that the ethanol Bane skin extract includes photochemical and inhibitory function against proliferation and inducer of apoptosis in human prostate cancer PC3 cells and also has less cytotoxic effect on l929 than PC3 cells. The ethanol Bane skin extract might be a good candidate for the new herbal anticancer drug. Copyright © 2016, Iranian Journal of Cancer Prevention.This is an open-access article distributed under the terms of the Creative Commons Attribution-NonCommercial 4.0 International License (http://creativecommons.org/licenses/by-nc/4.0/) which permits copy and redistribute the material just in noncommercial usages, provided the original work is properly cited. In the United States, prostate cancer is the second cause of cancer death after lung and bronchus in all ages of men (1). In Iran, prostate cancer is reportedly the third most commonly diagnosed visceral cancer, accounting for almost 7.75% of new cancer cases, and is the seventh result of cancer death. The overall detection rate of prostate cancer in Iran is 3.5% (2). According to Iran cancer report, the incidence rate of prostate cancer in Tehran is more than other provinces, about 16.65% - 26.35% (3). For high resistance of apoptosis in the androgen-independence of prostate cancer, there is no impressive therapy for controlling or treating prostate cancer. The current therapy (radiotherapy or cytotoxic chemotherapies) may have influence on patient condition, but these cures have significant side effects. Herbal medicine contains antitumor compounds as taxol and camptothecin. For these properties, many researchers studying plants are gaining more attention in chemotherapy (4). Over 7,000 species of plants grow in Iran among which 1000 are estimated to have medicinal effects. The presence of various climatic conditions and ecological factors provide an environment in which numerous varieties of plants grow in different regions of the country (5). The Psitacia atlantica sub kurdica from Anacardiaceae family, with the local name of Bane grows in Iran (6). Anacardiaceae family has antibacterial, fungicidal and cytotoxic properties. Studies have shown that Lithraeamolleoides has cytotoxic effects on human liver carcinoma cell line. Cytotoxic effect on breast cancer cell line and inhibition growth in leukemia cell line have been seen in nuts of Semecarpusanacardium (7). The studies indicated, same genuses of Bane have death properties and antiproliferative effect on some tumors. Despite many reports that are about chemo-preventive effect of the same genus of Bane, there are not any reports about the effects of atlantica sub kurdica on prostate cancer cell line, so we decided to evaluate the cytotoxic effect of ethanol Bane skin extract on prostate cancer cell line. PC3 (human prostate cancer cell lines) and L929 (mouse fibroblast cell line) were acquired from Pasture institute (Tehran, Iran) and cells were grown in RPMI 1640 supplemented with 5 ml of penicillin-streptomycin and 10% fetal bovine serum and in a humidified incubator containing 5% CO2. Cytotoxic effects of the ethanol Bane skin extract on PC3 cells were analyzed by colorimetric MTT assay. Mosmann introduced the colorimetric MTT assay and then this method was modified. A total 5000Pc-3 (human prostate cancer cell lines) and 5000L929 (mouse fibroblast cell line) from cell lines were cultured in 96-well plates. To 180 μL aliquots in four replicates of the cells seeded in 96-well, 20 μL aliquots of different concentrations were added to each of the wells to makeup the final Bane extract concentrations of 0.78, 1.5, 3.13, 6.25, 12.5 mg/mL. Every four well groups were marked for each concentration of the extract. No extract was added to the control group. Plates were incubated in a humidified 5% CO2 atmosphere, and after 24 hours, the growth medium was removed and washed with phosphate buffered solution (PBS). After that, 180 μL growths medium and 20 μL of 3-(4,5-dimethyl thiazol-2-yl)-2,5diphenyl tetrazolium bromide (MTT) solution were added for each well, then incubated for 4 hours. After removing the growth medium and shaking microplates for 2 to 3 minutes, dissolvation of crystals in 200 μL of PBS was achieved. The absorbance of Formosan dye was recorded by an ELISA plate reader at 570 nm. This procedure was repeated in the same manner after 48 and 72 hours. PC3 cells were cultured and incubated in 6 well plates at the situation described as noted before. The cells were faced with the ethanol Bane skin extract, then they were stained with 10% Giemsa and finally washed with phosphate buffered solution (PBS). Morphologic observations were seen to detect apoptotic cells by using a light Microscope. Statistical processing of the data was performed by SPSS v.20, using two-way ANOVA. 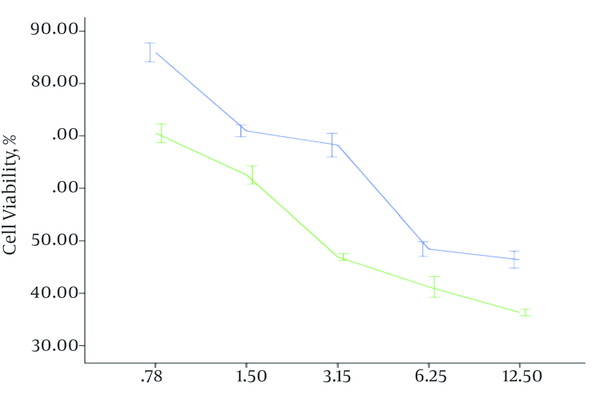 For detecting the point of difference, the post hoc test was used and P < 0.05 were considered statistically significant. The efficacy of the ethanol Bane skin extract on the viability of cells (PC3 and L929) were measured by MTT assay after 24, 48, 72 hours with the ethanol Bane skin extract concretions 0.78, 1.5, 3.13, 6.25, 12.5 mg/mL. Data analysis showed there is a good correlation among the ethanol Bane skin extract concentration and the time of exposing PC3 cells to the ethanol Bane skin extract and cell viability on PC3cells during this study (P < 0.001). 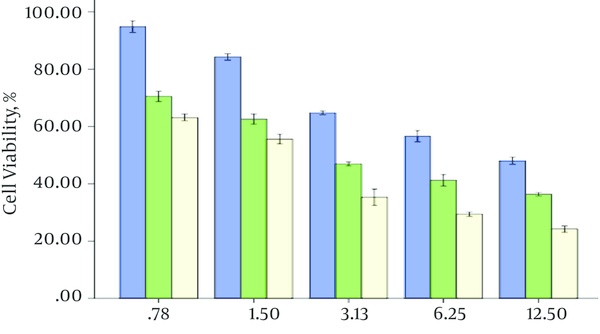 As shown in Figure 1, by increasing concentration of the ethanol Bane skin extract and time of exposing PC3 cells to the ethanol Bane skin extract, the cell viability reduced. The ethanol Bane skin extract has considerable growth inhibitory efficacy on PC3 cells. The IC50 (half inhibitory concentration) for the ethanol Bane skin extract on PC3 cells was 2.8 mg/mL after 48, but a different manner was seen on L929 cells. After 24 hours, no significant difference was seen in cell population between the control group and L929 cells exposed to the ethanol Bane skin extract in 0.78, 1.5, 3.13 mg/mL concentrations. The ethanol Bane skin extract has been light cytotoxic effect on l929 cells. This cytotoxic effect was considerably lower than on PC3 cells. The IC50 of the ethanol Bane skin extract on l929 cells after 48 hours was 6.1 mg/mL. It means that cytotoxic of ethanol Bane skin extract on PC3 cells is more than L929 cells (Figure 2), and also the researchers did not see a significant difference between cytotoxic effect of the ethanol Bane skin extract on l929 cells after 48 and 72 hours. The PC3 cells were exposed to the Bane extract (0.78, 1.5, 3.13, 6.25, 12.5 mg/mL) for 24, 48, 72 and cytotoxicity was determined using MTT assay. Data are shown as mean ± S.E. For detecting delete the Bane extract induction of apoptosis, morphological changes of the PC3 cells were examined. After staying PC3 cells whit Giemsa, examined morphological changes of the PC3 cells under a microscope and compared whit control group. Considerable morphological changes were observed in contrast with the morphology of the control cells (such as apoptotic bodies and condensed DNA) (Figure 3). A, Normal control PC3 cells; B, PC3 cells treated with 3.13 mg/mL Bane extract; C, PC3 cells treated with 6.25 mg/mL Bane extract. Apoptotic body formation with an increase in cytoplasm was observed. According to world health organization (WHO), 65% - 80% of the world population take traditional medicine to cure various diseases (8). It is estimated increasing androgen-independent prostate cancer may be for resisting apoptosis. This issue is along with survival of cells within metastatic or primary tumors and increased proliferation (9). Researchers revealed that a major problem with cancer therapy was lack of specificity of the treatments for this kind of cells (10). Natural products can be used as new therapeutic agents. Nowadays natural products and secondary metabolites act as good sources for treating coronary heart diseases, cancer, diabetes and infectious diseases in human (11). Many studies and experiments show that consumption of vegetables and fruits can reduce the risk of human cancer (12). Natural product can act as apoptosis inducer, so these products whit deleting precancerous cells can reduce cancer incidence (13). Many phytochemicals in different cell cultures acted as anticancer (14). Mixture of phytochemicals can be more effective than single constituents because of synergistic interactions (15). Pistacia is a genus of the Anacardiaceae family. The Pistacia have 15 species but only three species including Pistaciavera L., Pistacia khinjuk Stocks and Pistacia Atlantica Desf have been seen in Iran. These species have many applications in the field of folk medicine and also have been used in the therapy of throat infection, eczema, asthma and renal stone. Likewise, these have many uses as anti-inflammatory, antibacterial, stimulant, antiviral, astringent, antipyretic and pectoral (16). Pistacia species are being considered as good sources of antioxidants (6). The efficacy of Gum mastic of P. lentiscus in LNCaP prostate cancer cells has powerful inhibitory effect on expression and function of androgen receptor (7). Death inducing and anti-proliferative properties have been seen in human colon carcinoma when the cancer cells are exposed to P. lentiscus L. Balan (17) Repressed NF-kB activity, blocked cell cycle in the G1 phase, reduced expression of cyclin D1 in androgen-independent prostate cancer cells have reported as Gum mastic of P. lentiscus properties (18). Iin prostate cancer cells, Gum mastic of P. lentiscus has a rise in adjustment of mRNA and protein levels of tumor suppressor (19). Studies showed that skin extract of Bane is powerful than doxorubicin in some molecular ways and also induce apoptosis in in T47D cells (20). It is supposed that anticancer activity of Bane extract can have considerable amounts of polyphenolic compounds, flavonoids and anthocyanins (20). Another study shows that polyphenol rich extract of Bane in HT29 cells has apoptosis induction, growth inhibition, and cell cycle arrest properties (21). In the present study, for the first time, the researchers examined the cytotoxic effects of the ethanol Bane skin extract on PC3 cell line. The study reported that the ethanol Bane skin extract induced cytotoxicity in pc-3 cells and reduction of cell viability showed a time- and dose-dependent pattern and has less cytotoxic effect on L929 cells as normal cells than PC3 cells. Based on the morphological changes from our study, it was shown that the ethanol Bane skin extract induced the apoptosis in PC3 cells. Bane skin maybe a good candidate for the management of prostate cancer. For definitive conclusion, in vivo studies are required. Authors are thankful to the late Prof. Ali Rahimipour, Faculty of paramedical sciences, Shahid Beheshti Univercity of Medical Sciences, for his useful recommendation. Financial Diclosure: This research has funded by a grant from the Shahid Beheshti University of Medial Sciences.